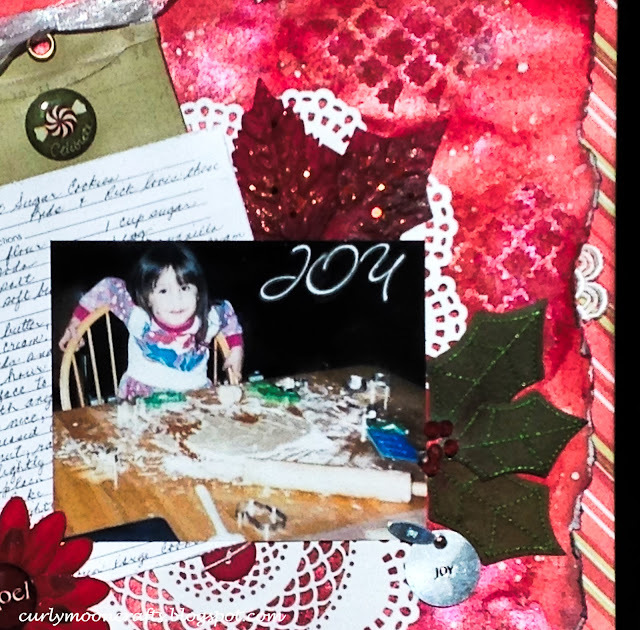 Hi Friends: Today's post is a layout of my daughter baking cookies when she was about 5 years old. Please see below for photos, process, challenges, and supplies. Have a super day! I prepped the paper with clear gesso. Once dry, I used a stencil and embossing paste to randomly apply texture to the page. After more drying, I used several red sprays to add color around the stenciled areas to help them stand out & make them shimmer. I tore the edges of the paper & used a distress tool to distress them a bit more. I used the Messy words stamp around the page to add a bit more interest, I cut my white doilies using a combination of dies to make them look a bit more like snowflake doilies, then layered them on my background. I added the sugar cookie recipe (I like that I use the same recipe that I apparently loved as a kid! ), and the photo. I added some ribbon to a pocket tag and tucked it behind the recipe. The holly leaves were 2 different bright green colors, so I added some red/orange distress inks to get them to a more olive color to match the color of the tag and added them around the photos. 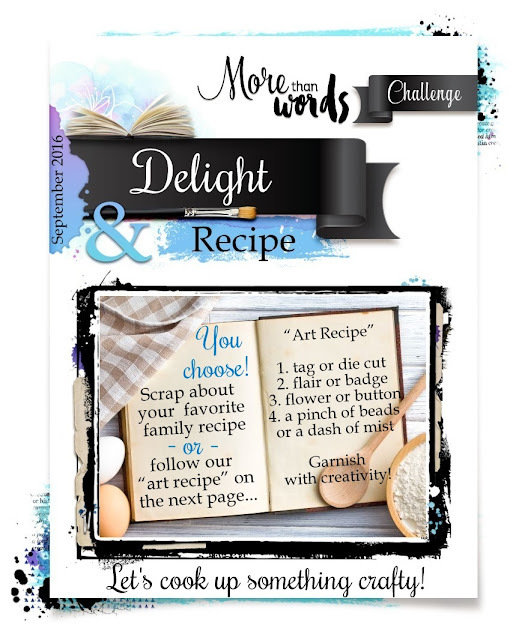 The key word for the challenge is Delight, so I used the synonym Joy on my page - I added a charm, photo holder, and rub-on letters to/near the photo. 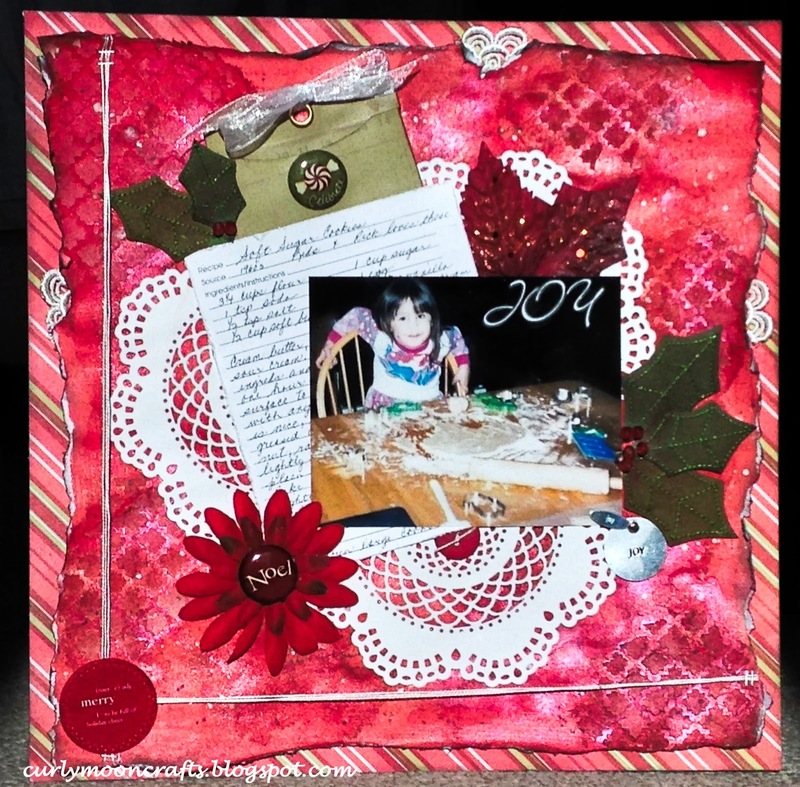 I found some lovely, sparkly red flowers and leaves in my stash and added them to the page. For badges/flairs, I used a couple of metal pinch tabs - one in the center of the flowers and the other tucked over the tag pocket. I added some perle thread to the edges of the page and added a transparency circle over the area where the threads cross. I added some Black Soot to the edges of the page, layered the primary page to a striped background paper, then added some splatters with Black Soot ink and the white Color Shine. I finished the page with a few bits of lace tucked behind some of the tears in the background. Oh this is adorable! I love that you've included the actual recipe. Great memory! Thanks for joining us at More Than Words. What a sweet layout! Love the overlapping doilies in the background. Thanks for playing along with us in the Frilly and Funkie Going in Circles Challenge! Lovely page! Thank you for playing with us at morethanwords challenge. This is indeed a treasure Patti! You certainly met the challenge this month! 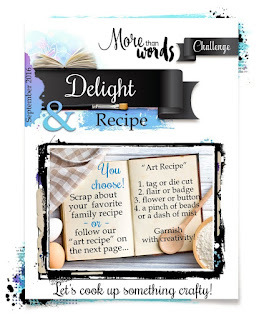 Thank you for sharing your recipe with us at More Than Words this month. I love this photo !! Children are great in kitchen, the best game ever is mixing random cooking ingredients !! Love your work on this page !! Thank you so much for joining us at More than Words !! She looks like she was having much fun! And that recipe looks yummy! Thank you for playing along with us at More Than Words! Awwww! What a fun day! You did a great job of capturing the moment, and I love the doily layers! Thanks so much for joining the fun at Frilly and Funkie "going round in circles" challenge!